Observation - Jacobsenia kolbei, Garies - Southern Africa. Description: Upright stems forming clumps, leaves, bright green, covered with glassy bladder cells. Flowers can be white or pink in one population. Upright stems forming clumps, leaves, bright green, covered with glassy bladder cells. 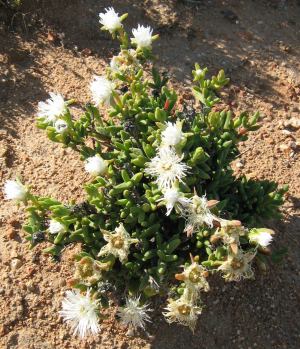 Flowers can be white or pink in one population.